Sarah was most recently seen as Marie in the remount of Paul Laverty’s JIMMY’S HALL directed by Graham McLaren for the Abbey Theatre. She will appear later this year as Janet in the Abbey Theatre rival of Deirdre Kinahan’s THE UNMANAGEABLE SISTERS. In 2016, Sarah appeared in the West End production of THE PLAY THAT GOES WRONG presented by Mischief Theatre Company at The Duchess Theatre and played Terry in RÓISÍN directed by Lisa Carroll at Old Red Lion Theatre. Other theatre work includes WE ARE NOT AFRAID directed by Anna Newell, EVERYTHING IS EQUALLY FAMILIAR at Center for Contemporary Art and Mariana in MEASURE FOR MEASURE with Dark Corner Theatre and Harold Pinters’ CELEBRATION directed by Wayne Jordan at the Gate Theatre, Dublin. Further stage credits include THE NOTORIOUS MRS. EBBSMITH directed by Abbey Wright at Jermyn Street Theatre, the role of Cat in DUCK (Out of Joint) and OUT OF THE CAGE directed by Alex Sweeney at Rose Theatre, Kingston. 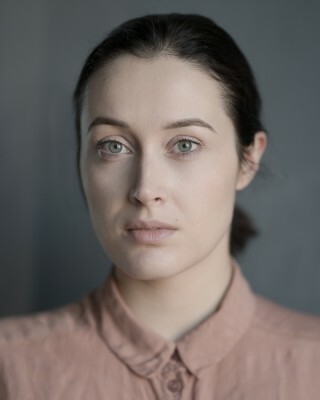 Recent screen credits include the role of Becky Smalley in DOCTORS directed by Paul Gibson for the BBC and Susan in Independent film STALLING directed by Bryan Moriarty. Previous screen appearances include the title role Gabreille Stokes in documentary drama MARÚ, Steph in SAOR SINN O OLC directed by Lawrence Gough for TG4 and played Mel in short film V.P directed by Andrew Nolan for Take Cover Films.